Bayern v Benfica was labelled das Endspiel (the final) for head coach Niko Kovac. The head coach silenced his critiques for now as his side walked away with a convincing victory from the Allianz Arena to qualify for the next round of the Champions League. It was a sluggish start to the match with Bayern. The Rekordmeister had plenty of possession but their attacking plays were too calculated and too easy to break down. Well at least until the 11′ minute when Arjen Robben produced a piece of magic. The winger cut through two Benfica defenders to break into the box deep on the right flank and the beat goalkeeper Odysseas Vlachodimos with a wonderful curled effort. Frank Ribéry should have then doubled the lead in the 19′ minute. The Frenchman was given way to much space to break through on the left, but his shot was not placed well enough and easily collected by Vlachodimos. 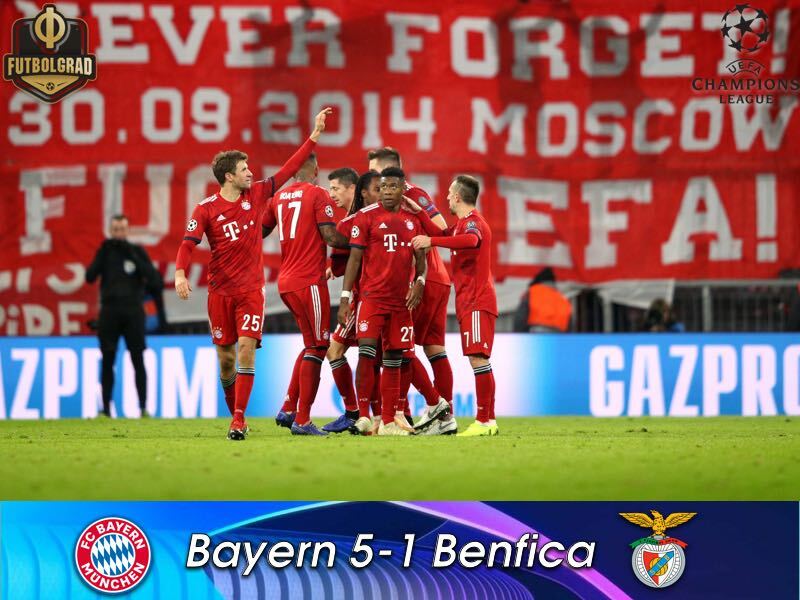 Three minutes late it was Robert Lewandowski testing the Benfica keeper, and Vlachodimos had to do well to tip the strikers curled effort from 18-yards over the crossbar. Bayern were on fire during this early stage, and in the 30′ minute Thomas Müller found Robben on the edge of the box and once again the Dutchman would use his trademark move, cut to the centre and shoot, to score his second of the night. Robben, in particular, was fantastic at this stage and in the 36′ he once again cut in from the right but opted to cross to the centre where Müller tested Vlachodimos with a close-range header. That following corner Bayern had their third. Joshua Kimmich provided a perfect corner that found Lewandowski wide open inside the box and the Polish forward scored with a header inside the six-yard box in the 37′ minute. Bayern were in complete control in the first half but defensive weaknesses, all too common under Kovac this season, showed straight off the second half kickoff. Gedson Fernandes, who had been brought on at halftime, won the ball in midfield and was given to much room by Bayern’s defence. Sprinting forward he unleashed a shot from the edge of the box that beat Manuel Neuer to make it 3-1 in the 46′ minute. But just four minutes later Bayern restored their three-goal cushion. Another Kimmich corner found Lewandowski and the Polish forward scored his second of the night to make it 4-1 in the 51′ minute. With any hope of a Benfica comeback right away crushed the edge was gone from the game. Bayern, in fact, almost looked like their former glorious self, in full control, looking for more goals to build up their confidence. In the 77′ it was Frank Ribéry’s turn to score, the Frenchman received a perfect ball from David Alaba, who had sprinted all the way to the byline, and made no mistake to score from just 12 yards out. That goal killed off the match. Bayern were now in complete control and Kovac brought on Sandro Wagner and debuted young Korean Woo-Yeoung Jeong to help see out the match. Joshua Kimmich was excellent in midfield. The 23-year-old highlighted why many pundits in Germany suggested that Kimmich might be wasted out wide. Completing 90.4% of his 75 passes Kimmich provided the sort of balance that has been lacking from the Rekordmeister all season long. Niko Kovac remains alive. Following that 3-3 draw against Fortuna anything but a convincing performance, tonight could have meant the end for the head coach at Bayern. But Kovac drew the right conclusions from the last few games. Moving Kimmich to midfield was a masterstroke. Trained in that position Kimmich has more or less been played out of position for the last two seasons. In midfield, he provided the sort of stability Bayern have been lacking. The performance by Robben, Ribéry and Müller in the last two games also suggest that Kovac may not have all the key players in the dressing room against him. Bayern have now scored 453 goals in the Champions League – only Real Madrid (548) and Barcelona (487) have scored more. Robben scored his 25th and 26th goal in European club competitions for Bayern and ended a lean period of 960 minutes without scoring in the Champions League. Ribéry also ended his goalscoring drought. The Frenchmen has not scored in the UCL since March 2015.